The link to which DEFRA is referring is a letter written by Prof. Christl Donnelly (Imperial College) on 06 January 2012 who has recently stated that she is neither for nor against the badger cull. This letter is eighteen months old; as you can see I pointed this out to DEFRA but so far have not had a reply. Press the download button for your own copy of the .pdf document. Yes, I am well acquainted with this paper by Christl Donnelly and Jim Hone. Remember that this is based on a model, but there is no reason to suspect that the output is not representative. However, we must remember that the proactive areas of the RBCT were selected as hot spots, as indeed were all the RBCT treatment areas. Therefore we should not assume that this is representative of all areas where TB is present in badgers and cattle. In fact there is likely to be a continuum from this possible maximum to zero. I have often been asked about this and perhaps the most important thing to say is that Christl herself is as opposed to culling as any other member of the Independent Scientific Group. The point here is that no matter what the contribution of badgers is to TB in cattle, the important question is what to do about it. Independent scientific opinion is that culling is very definitely not the answer. If we killed all the badgers we would still have the fundamental problem of lateral spread of disease in the cattle themselves. What the government is proposing is to kill around 70% of the badgers and their own best estimate is that this will achieve a relative reduction in cattle TB incidence of just 12-16% after nine years. Therefore even if badgers are responsible for half the TB breakdowns in cattle, killing them by the method used in the RBCT will only achieve a small reduction in cattle TB. It will also cost much more than it saves, is extremely unpopular and undermines any future vaccination strategy (because culling increases the prevalence of TB in badgers). Remember also that the government has made three fundamental changes to the conditions that applied in the RBCT: industry led instead of trained professionals, control by shooting instead of trapping, allowing six weeks for culling rather than 12 days as was the case in the RBCT. 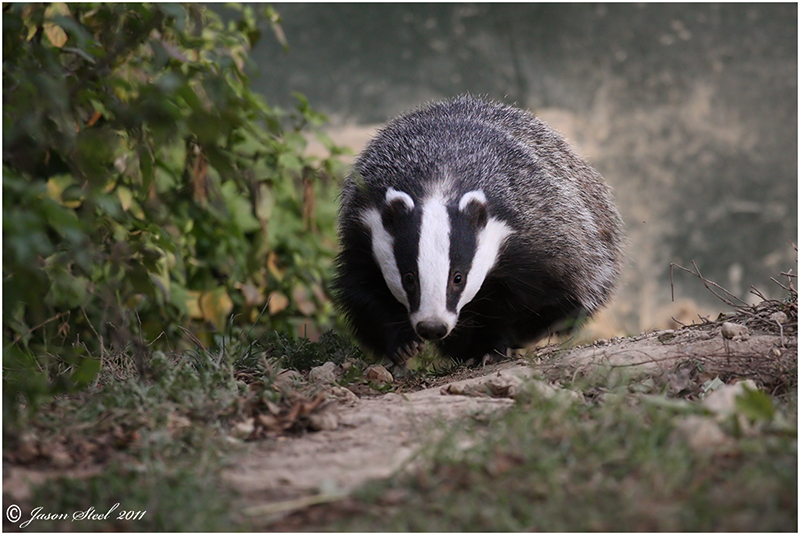 Independent scientific opinion believes that these changes could increase the negative perturbation effects of badger culling, therefore the assumption of the 12-16% reduction seen in the RBCT is unsafe. It could actually make things worse. And even worse than that, we will never know the effect of culling because there are no scientific controls. Careful consideration by the ISG led them to conclude that badger culling can make no meaningful contribution to the control of TB in cattle in Britain. QED. Nothing has changed and this paper by Christl hasn't changed anything either. We are in a situation now where the government and the NFU will use anything that seems on the face of it to be supporting their culling plans. It is a propaganda war. 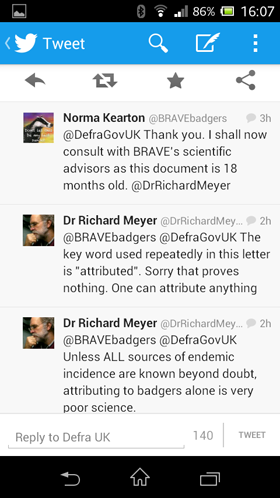 This is why Defra was so willing to send you the information. They have become very adept at side stepping or ignoring altogether any questions that are more searching and difficult to answer. I completely sympathise with your sentiments. We are in an unbelievable situation that is doomed to end in a complete mess. I had hoped that this would happen before any badgers were killed, but this government will not back down until they are forced to do so. More power to the protestors! The fate of badgers is largely in their hands now. Thank you. I'm aware of Prof. Donnelly's work of course, and would not argue with Chris Cheeseman's interpretation of the statistics, he is quite right as far as they go, however I come at this from a rather different perspective. But first of all, let's deal with the conclusions presented by the authors. As hinted at in my original brief tweet, the verb 'to attribute' is unsafe in science. My simple online dictionary defines the word as, 'To think of something as caused by a particular circumstance' (Encarta ® World English Dictionary © & (P) 1998-2004 Microsoft Corporation). I haven't bothered to go to a fuller definition because this says enough. The word is used 6 times (including in the title). The authors may or may not be correct in their assumption viz a viz infectious badgers. I know, as Chris has said elsewhere, that scientists are a reserved and cautious lot, and they are quite right to be. Yet, it begs the question, Why? In my view, it is because we never know for certain. Scientific knowledge presents a snapshot in time, just waiting to be improved and revised. It's the way knowledge progresses. I am very suspicious of mathematical modelling as applied to a wild or semi-wild dynamic situation simply because we can never know all confounding variables, of which there is an infinite number. Statisticians love to look at mathematics and apply them to natural ecosystems (it saves them from going out and getting their knees dirty!) but they are seldom good enough. Computer models have their place of course but are best confined to laboratory or desk science, where rigorous controls can be instituted. Moreover, to 'estimate' is, again to quote my simple dictionary, "to make an approximate calculation of something". It is used in this letter eight times (again also in the title). It is effectively a 'best guess', and the authors are quite right to use it here because they do not, and cannot know, with any meaningful significant degree of certainty. We should not kill thousands of 'protected' wild animals on a political hunch. So I would be very wary about acclaiming these data as 'representative' though they might be. But if I may cast a different light on this and similar work because, as Chris says, Defra has become very adept over several decades at massaging statistics and promoting useful data while suppressing counter evidence. [I will never forget Paul Benham's MAFF funded work on cattle-badger nocturnal interaction being suppressed back in the 80s because it showed cattle avoiding badger products] However, what I and hundreds of thousands of others object to is the government's cavalier approach to the massacre of an iconic wild animal on trumped up evidence. I object, for example, to the crocodile tears shed over suffering badgers for example, and equally theatrical tears over diseased cattle, which everyone knows are bred as a business and for our convenience and pleasure (as a vegetarian would certainly claim, and I wouldn't necessarily argue with that). Agriculture is an industry and must first put its own house in order, i.e. vaccinate cattle. As a society, furthermore, I don't believe we should ascribe the same values to wild and domesticated animals. Disease is a natural part of population control within a natural ecosystem. In short, the incessant focus on the badger forces us to take our eye off the larger ball. My friend, Vic Simpson, erstwhile MAFF pathologist at the Polwhele VI Centre, was insistent on the endemic nature of this bacillus in the environment and therefore a range of host species. The concentration on one large and noticeable species does agriculture no service and merely panders to simple farmers who demand that "Something must be done". All good wishes in your noble and frustrating struggle for good over evil ! The stakes are high. 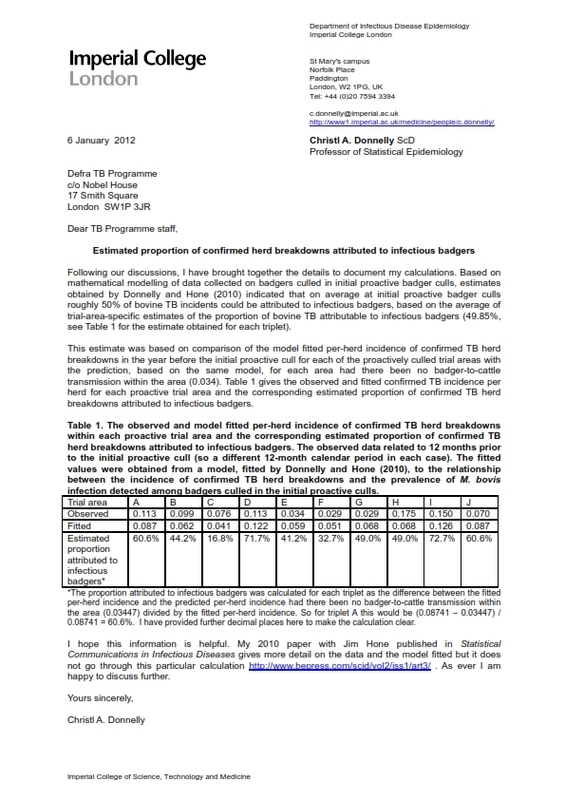 Cattle TB is currently costing UK taxpayers £90 million a year to control. Badger culling, as a method to control TB in cattle, is highly controversial. The science base relating to cattle TB control is often misunderstood (sometimes wilfully). This talk will review the science and the UK policies as they stand today. When should a policy be called "science-based"? And does "science-informed" policy deliver what it appears to promise? Invited discussant: Prof. James Wood (Cambridge), who will particularly address the issue of cattle controls. "We are in a situation now where the government and the NFU will use anything that seems on the face of it to be supporting their culling plans. It is a propaganda war. 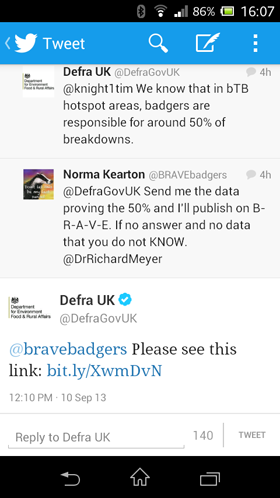 This is why Defra was so willing to send you the information. They have become very adept at side stepping or ignoring altogether any questions that are more searching and difficult to answer. I completely sympathise with your sentiments. We are in an unbelievable situation that is doomed to end in a complete mess. I had hoped that this would happen before any badgers were killed, but this government will not back down until they are forced to do so. Very best to you all."